Every two years, the National Aeronautics and Space Administration (NASA) solicits applications for its astronaut candidate program. Appropriate to its inception in the Cold War, NASA’s astronaut program originally targeted the best and brightest pilots in the U.S. military, among them naval aviator Scott Carpenter and fellow Marine John Glenn. Astronauts have since been drawn from more diverse civilian communities like engineers, scientists and educators, but the military remains an important source of candidates. Current astronaut candidates in the military retain their rank and service obligations while assigned to the Lyndon Johnson Space Center in Houston, Texas, for a five-year tour. 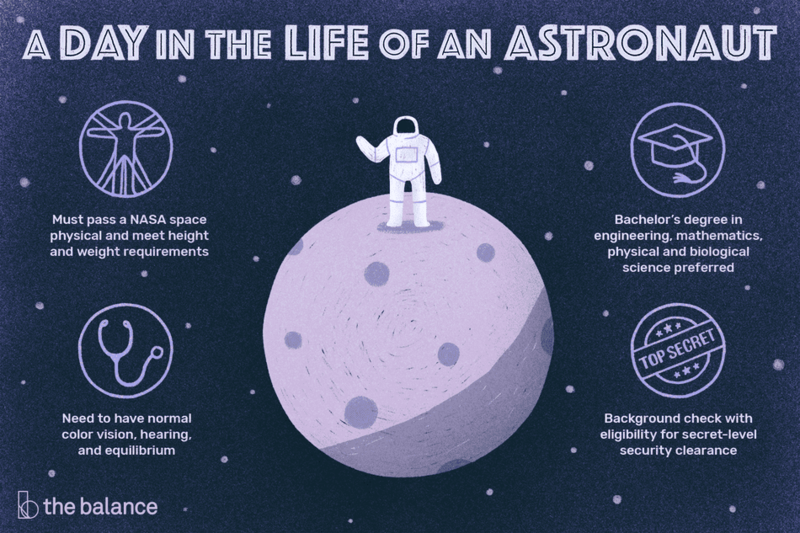 Although post-baccalaureate degrees are preferred, NASA wants astronauts with at least a bachelor’s degree – specifically one focused on engineering, biological science, physical science, or mathematics. They also don’t want new graduates: Prospective astronauts must have at least three years of related, progressively responsible, professional experience. although a master's degree can replace one year, and a doctoral three years, of that requirement. Shuttle pilots and commanders also need a minimum of 1,000 hours of experience as a pilot-in-command. Also, any candidate – military or civilian – must pass a NASA space physical and meet specific height and weight requirements. Like other personnel hoping to qualify for space travel, astronauts need to have normal color vision (no colorblindness), hearing and equilibrium. They should have no history of chronic migraines, epilepsy, or psychological conditions such as claustrophobia. If you have a condition that requires medications that may affect alertness or judgment, you're likely precluded from becoming an astronaut. Astronaut candidates must also pass a background check with eligibility for at least a . This involves an in-depth background check of character and finances, and a history of drug use or alcohol abuse may be disqualifying. In general, military astronaut candidates are U.S. citizens and with at least five years of active duty service. All NASA hopefuls apply through federal recruiting hub , but military candidates also forward the application through their chain of command. Even though NASA sees the application right away, the services each have a say in the process through a selection board – the same kind of headquarters committee that decides promotions. The Marine Corps, however, dropped the selection board in April 2012, figuring NASA knew best how to pick an astronaut. Getting into the astronaut program through the military is a worthy goal, but it requires a lot of patience, foresight, and dedication. And with no guarantees of the future of the space program, there may be a lot of uncertainty about what jobs will be available to trained astronauts, and when.